As hard as it is to believe, I have never dined at Seattle’s Canlis Restaurant, a top caliber dining spot where the elite gathers to dine and enjoy being entertained. A world famous American pianist, composer, and arranger, Walt Wagner, who is once more based in Seattle, Washington often plays at Canlis. No matter. I have never broken out my wallet and headed for Canlis. Walt, who I get to call Walt because we played in the Foster High School band together, played trombone in school and classical piano at home. My ego might be a bit overzealous, but I have always thought Walt’s and my collaborative time together during our high school band years explains how he became such a massive success in the music world. While I played clarinet and sax, you might say I taught Walt everything I knew about music. Well, you might not say that, but I might. Some of our fellow band members observing Walt and I playing together in the old days might say, I did not know much. Admitting that may be true does not negate my opportunity to brag up the fact that I taught Walt everything I knew. Had I kept up with my music, I could have played in the famous Walt Wagner Trio, or I could have been with him when he played on Johnny Carson’s Tonight Show. Decades ago in the late 1960s, while driving down the main road in Spokane, Washington, in my 1967 Austin Healey 3000 Mk III with the top down and the 8-track playing, I spotted a restaurant reader-board that read, “Walt Wagner Trio.” I turned around on a dime and entered the restaurant to hear Walt. I sent a note up to the bandstand saying something like, “Hey unh! This is Joe Boyle from Foster High School holding down table #4. Walt has always been such a down to earth guy. During his break, he sat with us for a fun visit. Everybody in the joint wondered who the big shot and his wife were. Well, I was not a big shot, but Walt made me feel like one. The reason I have never been to Canlis with their valet parking is that when I was poor and starting out, I was financially traumatized by the Canlis à la carte menu pricing. Besides that, I could not cozy up to the idea of turning my car keys over to some stranger who Canlis called by the fancy name of Valet. Lastly, I have trouble pronouncing Valet. So the other day my high school buddy, Larry King, whose musical talent is limited to playing the radio, suggested we have lunch together. While the depression of 1929 occurred before I was born, I still inherited the negative impact of the financial crash through my parents and grandparents. My father-in-law almost starved in college back in 1929. Add to that the fact that the pricing at Canlis had traumatized me during my teenage dating years; I could still not drive up to Canlis. Yes, Larry and I could go to lunch, but not Canlis. We wondered how we might enjoy a unique dining experience with some compelling music, savory food and a tasty beverage without emptying our wallets. After all, we are now both retired and on fixed incomes. Larry said, “I have an idea. Let’s enjoy an Alley Lunch”. If you have never heard of an Alley Lunch, and I am sure you have not because Larry and I just made up this brand new term which is sure to catch hold and rise in popularity among those who are hip, here is how it works. Step 1: Pull into the Frisko Freeze parking lot located at 1201 Division Avenue, Tacoma, Washington 98403. T: 253-272-4800. 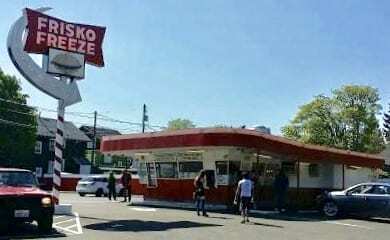 While readers may not feel an old beat up drive-in like Frisko Freeze could compete with Canlis Restaurant, it should be noted that our former Washington State Governor, Booth Gardner, loved Frisko Freeze and ate there as often as possible. We never heard of Governor Booth dining at Canlis. Step 3. When you get close enough to the old building to read the menu plastered on the windows, start figuring out what your hand made dining pleasure is going to be. Step 4: When your turn finally arrives, pull up to the window and bark your order to the window guy. After ordering one beef burger with grilled onions and a banana shake, Larry ordered five double cheeseburgers and a chocolate shake. Larry reminded me of the line, “I can eat 50 eggs” from Paul Newman’s movie, Cool Hand Luke. I was looking forward to watching my 74-year-old pal eat five burgers. It was like we were back in high school again. I, on the other hand, wishing to stay close to my high school weight, thought one beef burger and one banana shake would be quite sufficient. Step 5: Drive all six burgers and the two shakes over to an alley near 6th and Sheridan where we met Larry’s son, Matt, and Matt’s friend Peter. Step 6: Larry distributed two burgers a piece to the two hard-working young guys. Larry kept one burger for himself and the chocolate shake. I grabbed the beef burger and shake, and the four of us enjoyed our Alley Lunch. Larry and I parked right in the middle of the alley blocking traffic. We had the top down to enjoy the sun and to make it easy to visit with Matt and Peter. The young guys stood in the alley eating off the tailgate of their construction truck. Oh, as far as music goes, my car stereo belted out the Blues on Pandora. The alley scene, including the house the boys were working on, reminded me of the 1970s when Larry and I jacked up the home at 805 South Steele, Tacoma, Washington, and had Larry Capps, the infamous Wau, drop the house back down on a brand new block foundation he had built for us. The house still stands tall to this day and is looking good. When you head out for an Alley Lunch, unlike at restaurants such as Canlis, you will always get a great place to sit. If the cops chase you off the alley, you drive your Frisko Freeze burgers down the street until you find another alley. Hmmm! I wonder if Matt and Peter will ever treat Larry and his pal, Joe, to lunch at Canlis? Now that would be a magnanimous gesture. I too have not dined at Canlis. During the late 70s there was a restaurant on Pacific, I think called Tony C’s, which was supposedly the son . . . Peg and I loved the place. We liked to sit at the bar and watch the chefs cook. They cut a sawtooth design in the middle of a lemon, so when complete the lemon came a apart in two pieces with each portion resembling a crown, which they would then dip the teeth into paprika giving it a distinctive appearance. They did this for lobster dinners. We love lobster dinner. One night we were watching the chef and he inadvertently spilled a little too much paprika onto the plate. He held up the plate and blew the paprika off the plate . . . when his eyes moved up from the plate he found himself looking directly into my eyes . . . “Let me guess,” he said, “these are for you?” I nodded. We laughed as he got new plates and an uncut lemon and started over. Please, let me know when you want to take us out to dinner in Seattle. We’re not a cheap date, but we are reasonable. I was at Canlis for dinner once about fifty years ago. I can’t remember the occasion or who I was with, but the last payment is due next month. A 4 course meal is only $135 plus 20% gratuity. Fried rabbit looks good…… was wondering what happened to my Oakbrook neighborhood rabbits! Thank you for your comment and the most interesting link to the Canlis website. Back in 1962 when I was 19 years old earning a minimum wage of $1.25 the Canlis menu was probably hitting $17 X 2 for two plates + tip + valet car parking tip. All total, $44. Shocking to a teenager who could take his date to Johnnie’s Dock for maybe $12 – $15. I admit I was traumatized financially and never got over it. I just learned my daughter went to Canlis while in high school during the late 1980s. At least one member of my family made it into the big time. … or drive the freeway! A nice, warm story for a very cold day, Joe. I’ll bet you’re going to be eating at home the next few days, like the rest of us. Hope Kjeri stocked up before the crowds hit the stores.